The Japanese ship industry (which includes the shipbuilding industry and the ship machinery industry that supports it) and the shipping industry continue to maintain their core positions in the world in the midst of severe international competition. Despite this, in recent times, under the excessively fierce competition caused by factors such as the overproduction of ships and superfluous building facilities and equipment, it is necessary for us to further enhance our competitiveness; and the need for a strategic approach to business leveraging our technological capabilities is greater than ever before. In order to achieve this, JSTRA will formulate strategies from an integrated R&D-based perspective for the development of international regulations and standards in the maritime field, and seek to affect an effective and agile response supported by Japanese technological capabilities. 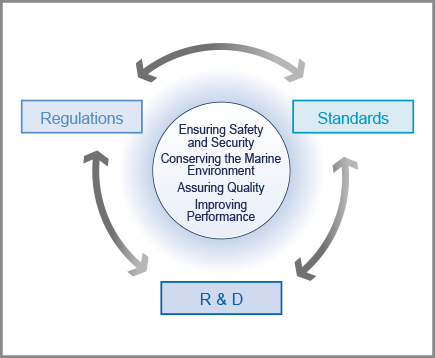 In R&D, we will tackle issues that cater to the needs of the maritime industries. By doing so, we will help to enhance Japan’s international competitiveness and contribute to ensuring the safety of the international society and conserving the global environment. Based on this operating policy, JSTRA will seek to promote and drive mutual partnerships between the worlds of industry (the shipping, shipbuilding and ship machinery industries), government (inspection organizations and other government agencies) and academia (universities, research institutes and academic societies). JSTRA has established a Ship Technology Strategy Board (chaired by Tomokazu Taniguchi) with the participation of various concerned parties; including stakeholders from the shipbuilding and ship machinery industries, the shipping industry, universities, research institutions, academic societies, ship inspection organizations and various government agencies. Through this committee, JSTRA formulates and follows up on strategies that approach R&D, regulations and standards in an integrated manner. STRA has been designated as a recommended organization for funding schemes operated by The Nippon Foundation. JSTRA recommends inventions and designs in the field of shipbuilding and ship machinery for awards offered by the Minister of Land, Infrastructure, Transport and Tourism, and the directors of regional District Transport Bureaus, etc. JSTRA has been designated by the National Personnel Authority an examination and study organization for human resources exchanges.